Many of us have Facebook accounts. But the question is – How are we using them? Most of us are using them in a wonderful casual way to stay connected to our family and friends. That’s great! That is one of the key reasons we have a Facebook account. Any of the group styles will work! It is your choice! Let’s say you will use the “secret” group option. To learn more about this type of group, read the Social Media Examiner Post about How to Use Secret Facebook Groups to Enhance Your Business you’ll notice that a business group may utilize this type of function. As you read this post, allow your imagination to consider how a FB group could be used in your ministry setting with families this Advent season. Two weeks before the First Week of Advent, using the family email addresses, I would send a “brief” email inviting the families of the children that are in my class to participate with all of us during the Advent Season by taking a few moments out of their busy schedules to read and reflect on the Sunday Scripture readings. Tell them that there will be a link to the Sunday Readings for them each week. When they are ready, they can share their comment or question on our special group FB wall. Or, send a flyer home to the parents via your students and include an announcement in your parish bulletin about the group. One day after the email is sent, send a “tweet” and “text message” to invite your parents to read the email message from you. 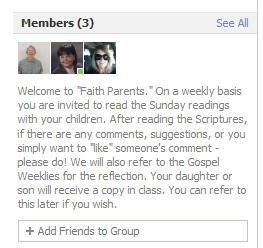 One Week Before Advent begins: Invite each family to the FB group. Post the Sunday Scripture Readings for the 1st Sunday in Advent, using the link from the USCCB Readings website. To get the conversation going, you may have encouraged several of your parents to post their reflection early in the week. Make sure you check the posts at least once daily and comment back. Remember, this is a place for a simple online conversation and sharing about what these Scriptures mean to you. At the end of the Advent Season, thank your parents for their participation in the Advent Scripture sharing. You may want to use a Zoomerang survey to get feedback about their experience with this online faith sharing activity. I hope that this article has sparked a possibility or two in your imagination. More importantly, I trust that you will share your story about how you are going to use (or thinking of using) a FB group in your ministry with families, or youth groups (13 and older), or RCIA ministry. Looking forward to hearing from you! Join in the conversation! Remember to click on the “like” button if you like this post. Or, forward this link to other catechists who would be interested in hosting an Advent online Scripture Reflection group with parents, young adults, and anyone who is interested in sharing online. Trends and Challenges: What Parish Technologists? I’m delighted that you find this helpful! There is so much we can do with the Facebook tool. Would love to hear from others how they are being creative with this tool – especially during the Advent season! May I also suggest some resources free to users at FranciscanMedia.org. The Sharing the Word, Sunday Soundbite and Saint of the Day features are excellent. The site will also feature a rotation of video reflections throughout the Season. Thank you! This is a wonderful suggestion. I like the Sunday Soundbites! I’m glad this is helping you! And there are many possibilities! Sister, The Face Book Group platform is the vehicle I have used for my SITM 2011 Capstone Project and I could use some pointers to know what I can and cannot embed on face book group page, Animoto, Wordle, etc. Also The Group was established by invitation after a sign-up sheet was circulated in our small group, Divine Mercy Prayer Group. Face Book is a social networking platform that was most familiar to the population in our Divine Mercy Prayer Group and was the easiest to get accounts set up for everyone. It is growing in use and helpful in keeping members in touch. Hi Glennell, I’m not surprised that FB was the most familiar social networking tools with your Divine Mercy Prayer Group. Let’s set-up a time to chat via GTM so that I can answer your questions about the pointers that you need. You have my email. Just give me several dates and times. http://www.kissingtheleper.com. Thanks for sharing such great ideas! Come back and visit! Thanks for sharing ACyberpilgrim with your readers.